This is now my number one vacation experience of my life. 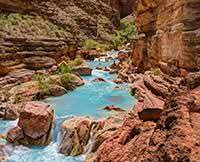 From the Bar 10 Ranch to Lake Mead, I experienced a wonderful adventure of "firsts"....like sleeping in a covered wagon, flying in a helicopter, riding the rapids on a raft, seeing the beautiful Grand Canyon, sleeping under the stars, CAMPING, and riding a jet boat. Even the unexpected rainstorm which drenched us at 2 a.m. one morning, was memory making. The hospitable cowboys and girls and the river guides made this trip move to the top of my list of favorite vacations. THANKS!